It was cool and cloudy last Saturday and although I don’t need an excuse to make soup, the gloom outside was calling for the soup pot. Creamy chickpeas and silky sweet leeks give this soup a lovely smooth comforting feel, yet keeping a bit of texture. It tastes fantastic. 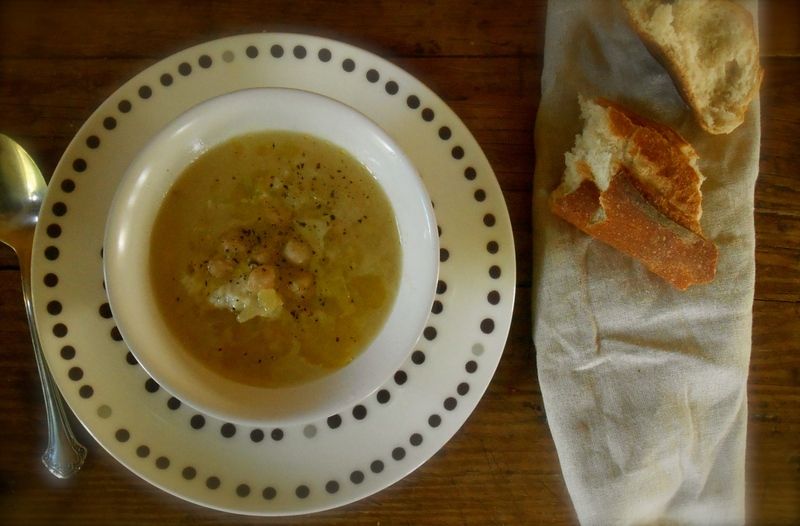 The soup went wonderfully with a nice bottle of Cabernet from Washington State and a freshly baked crusty baguette from my favorite bakery. Slightly adapted recipe from Jamie Oliver’s The Naked Chef. Heat a heavy bottomed pan over medium high, add the oil and the butter. Add the leeks and garlic to the pan, and cook gently with a good pinch of salt until tender and sweet. Add the chickpeas, potato and bay leaves; cook for one minute. Add stock and simmer for 15 minutes. Ladle out 1/2 of the soup into a large bowl and using a hand blender whizz until smooth, or ladle into a blender and whirl if you are using one. (make sure to keep a breathing space on your blender lid so you do not have hot soup exploding in your kitchen!) Return the smooth portion to the pot, stir well and check for seasoning, add parmesan to taste to round off the flavors. Serve soup with a drizzle of good extra virgin olive oil, shaved parmesan and a twist or two of freshly ground black pepper. A very good looking soup and I bet very tasty. Yes, very tasty indeed. :) Thank you. Beautiful presentation, loved the bowl and the plate underneath… wow! plus, the soup itself is a dream! You know, I have all those ingredients…so there is no excuse for making this fabulous soup. Looks wonderful – perhaps paired with a freshly baked focaccia. I’m making it this morning, but without the ginger (though it is an interesting ingredient), substituting chopped fresh rosemary instead. Thought I should pass it along. Aw! Thank you very much I’m headed over now for a look. Sounds great! Chickpeas and leeks, two of my favorite comfort foods, especially in soup. At least this is a beautiful sunny week in Seattle, during which, this soup still would be good. Love this soup Cottage Girl! Potato, leeks and chickpeas gonzo well together and now in a soup! I am making it soon :). Hi Sonal. I thought it was perfect together. Such a delight and no leftovers. I’ll have to make another pot, I didn’t get enough! :). It sounds so comforting! It’s gone cool here too. You are giving me ideas, nice ideas. Oh good…I like Conor ideas. I have seen your good ideas! We were just at the cabin, and Sophie and I took a long walk in the woods, and picked a whole bunch of leeks! Well, I picked leeks while she stood on guard for bears… :-) I’ve been wondering what to make with them… and was thinking potato soup, but I think that I have plenty to make both!! Oooo, fresh wild leeks?! Oh my goodness. Several years ago I lived in the high desert and I found an oasis way up this dirt road on the top of a hill full of wild onions! I kept (four wheelin’) up there as much as possible in the spring and brought back loads of them! You just reminded me of this…hope you find something wonderful to do with them. ;) Thanks for the memory! I just adore the way Jamie Oliver cooks and this recipe looks wonderful. Soups are my favorite foods! I am new to Jamie Oliver’s recipes! Can you believe that? I really like them too. I found a copy The Naked Chef at a second hand store and have been really turning out some fabulous recipes. And you know what, soups are my favorite food too! Very nice my friend. as per usual. Any soup with. Chickpeas in it is a friend of mine. I’ve become quite fond of chickpeas myself and now can’t seem to quit buying them. Thanks! Sounds like you have strange weather patterns too. It’s hot here today, well, hot for me is 70°! Seriously, if it reaches 90 in the summer we are dying over here. But, I’m with you Karen, we eat soup in the summer too. Exactly! Always available and seemingly always on hand. Thank you…. lovely combination, a sure winner! Thank you. Certainly was a perfect soup for lunch. A really handsome bowl of soup, it’s so simple but I can tell the flavor is amazing. Your photo’s are beautiful too! If we have another cool day I’ll be making this, saved! Wondering if New York just up and changes to hot. Seems like Seattle gradually changes and bounces in and out of cool and hot until July. I do know you really get the heat though don’t you! It’s a great soup, and super easy to throw together. We pretty much go from cold to hot quickly. Just a couple of days ago I still wore my down jacket and now it’s shorts and flip flops. Don’t think we will see another cool day until November. I will make this soup! That sounds really nice. Shame I can’t get nice looking leeks anymore. It’ll be late Autumn before they start to look and taste really good again over here. Anyway, must pop into your fava bean soup post as I have dried split fava beans soaking – how exciting! – to make it tomorrow. I’ve never had fava beans, that I’m aware off, so I am thrilled to be making something new. I can’t wait to hear about your soup, especially using dried fava beans. The fresh one’s are in full harvest these days, but I’m finding myself hesitating to buy them since they are a bit of work. I need to have some time on my hands to be in the kitchen, which I haven’t had much of this past week. I’m thrilled you are finding the soup recipe interesting enough to make Johnny! Just in time for the cold weather here, thanks! :) I’d like to slip over to your country for the next three or four months…I like cooler weather! That is exactly what this soup is…soothing and mellow. You described it perfectly Deena! Thank you…. :) I wish it was cold here Leah. 75°F is really warm for us and I don’t particularly like hot weather. I know I raise a few eyebrows admitting this! The soup is so easy to put together, it’s very delicious! That’s a good thing…right? :) It really is comfort in a bowl, best way to describe it Liz. It looks very tasty and delicious (bay leaves, chickpeas and leeks) :) so flavorful! Chickpeas and leeks are two of my absolute favorites! Just might have to make this. This soup looks so perfectly warm and comforting. I can almost smell those chickpeas, just lovely! Thank you so much Mary Frances. :) Aren’t chickpeas so lovely! I could eat them everyday, my favorite. This sounds so good, and somehow so decadent, even though it’s not like it calls for too many super decadent ingredients… I love that top photo, too! I need to make soup all the time, as my son takes a little flask of soup for his lunch nearly everyday. This soup will be joining my soup rotation! Thank you for the recipe! My youngest daughter and I love chickpea soup. The addition of leeks must take it to a whole new level. Looks so comforting Seana. Just what I need! This soup does look simple and full of flavor– and it’s beautiful in the bowl. This one is going on my “to-make” list. I have a couple of leeks that need cooking. Thanks! This looks perfect. I’m obsessed with chickpeas at the moment so it’s going on my list! Oh my gosh my list is getting so long…. Too many great recipes, not enough meals to eat them all in! I’m obsessed too. Don’t know why I’m suddenly in love with chickpeas. I’ve always like them, but more recently I have been using them at least once a week. 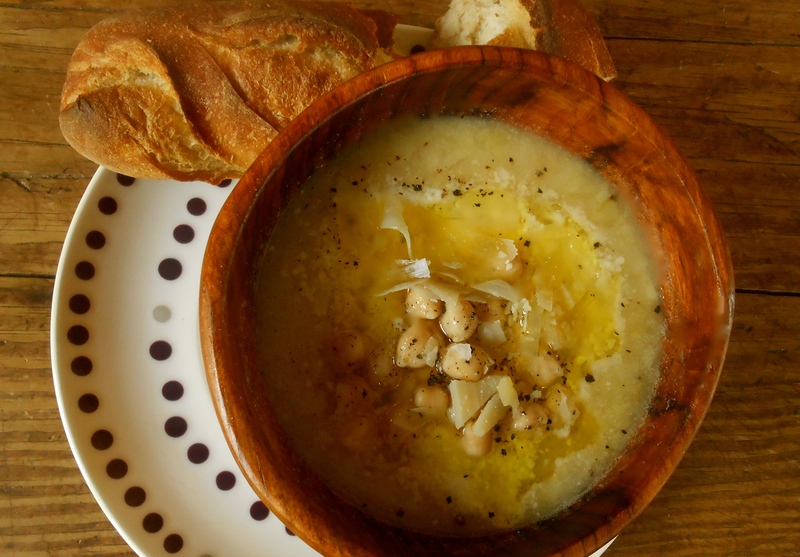 You are currently reading chickpea & leek soup at COTTAGE GROVE HOUSE.